There’s power and then there’s empowerment. It has been about who has the former and who receives the latter. In the corporate context, leaders that are considered to be people centered follow a developmental style of management empowering with the hope of achieving employee self-actualisation. This is changing. The invitation from increasingly conscious leadership is that empowerment is self-regulating. Empowerment is a personal choice. After many conversations and a lot of feedback about where they are CEO Tony Hsieh, of the online clothing company Zappos, decided to take drastic action. He sent his employees an email memo (provided to Fast Company, Zappos CEO Tony Hsieh: Adopt Holacracy Or Leave) in which he offers them an ultimatum to move to a desired state of self-organization, self-management, increased autonomy, and increased efficiency. For better context, he recommended they read the two articles: Misperceptions of Self-Management and Five Crucial Competencies of Self-Management. These articles highlight really interesting content about power and empowerment in an organisational context. Making a stand to show up as powerful requires proactively choosing to be responsible for your destiny. It is that or remain the victim of circumstance beyond you control. And, this can be done without compromising your values. Power does not have to be gregarious, in your face, as the expense of others. This is not about being narcissistic. It can be done humble (rather than submissive) way, with equanimity when the pressure is on and true colour come to the fore. 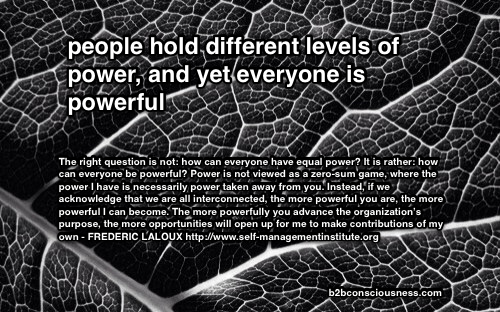 Laloux refers to self-managing organisations where people are not empowered by the good graces of other people, the leadership. Empowerment is baked into the very fabric of the organization, into its structure, processes, and practices. Individuals need not fight for power. They simply have it. For people experiencing self-management for the first time, the ride can be bittersweet at first. With freedom comes responsibility: you can no longer throw problems, harsh decisions, or difficult calls up the hierarchy and let your bosses take care of it. You can’t take refuge in blame, apathy, or resentfulness. Everybody needs to grow up and take full responsibility for their thoughts and actions―a steep learning curve for some people. 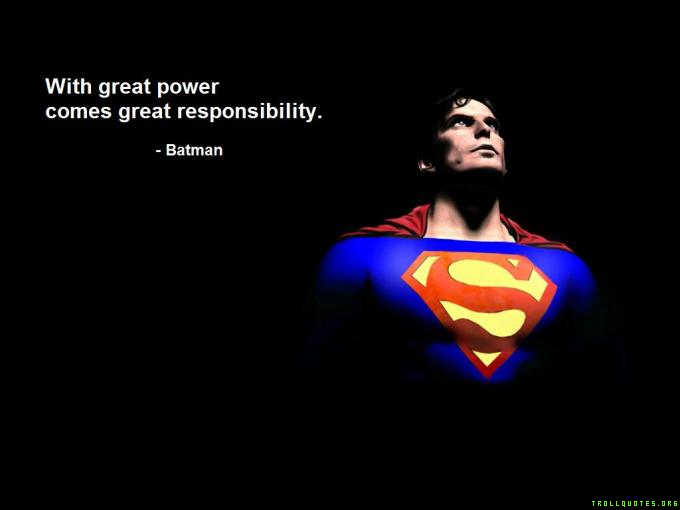 With power comes great responsibility, yet with responsibility come great power, too. As power relates to position, it is often associated with control. However, to gain control one has to relinquish control. Power is also associated with an authoritarian style of management driven by antagonistic, adversarial and coercive thinking patterns. Empowerment comes with a more developmental management style supported by mutually agreed results orientation, people centeredness that affords self-actualisation. This thinking applies to managing and preference as to how one wants to be managed. in my opinion, it does not take being a self-managed, self organised to be powerful? It is possible to take responsibility and empower yourself in all circumstances. This comes about when you have a thought or a feeling and make a decision to choose between being a victim of those circumstances to take responsibility for your own power – be in action that lines up what puts you into flow, aligns with your values and fulfils your purpose. “Can man lift himself up by his bootstraps? Why not? All he has to do is increase his buoyancy and he’ll effortlessly rise to a higher state. Force cannot accomplish that feat; power not only can, but constantly does.” David Hawkins in his book Power vs Force makes this distinction between force and power. The clear distinction in power taken or given in an empowerment context applied in an organisation is a great leadership enquiry for those seeking to empower as opposed to creating the environment for empowerment to happen through employee self-determination. Zappos CEO Tony Hsieh: Adopt Holacracy Or Leave.